51 Awesome Things To Do in Bali: Attractions, tours & more! Make the most of your island vacay with these awesome activities in Bali, from waterfall jumping and beach club hopping, to temple exploring and Seminyak shopping! Bali is no doubt one of the world’s best holiday destinations – and it’s easy to see why. With its pristine beaches, rich culture, world-class dining destinations and awesome attractions, Bali is a wanderluster’s dream. Whether you want a sun-soaked beach getaway, a relaxing spa break, an off-the-beaten-path adventure, or you just want to wine, dine and shop your way across the island, there really is something for everyone. 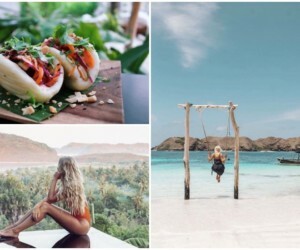 No matter your holidaying fancy, be sure to tick off these 51 things to do in Bali – straight from the people in the know! Sun, sand & sea – Bali’s best beaches tick all the boxes! Cool ocean breezes, salty hair, sun-kissed skin and that book you’ve been dying to get stuck into for months – beach life doesn’t get much better than that, right? Well, Bali’s best beaches also come with glamorous sunset cocktails, world-class surfing, some wild watersport adventures and world-class beach clubs to boot. So pack your sunscreen, wrap up your sarong and prep a summer playlist, because you’ll want to tick all of Bali’s beaches off your bucket list. With so many fragrant herbs, spices, farm-fresh produce and unique flavours available across Indonesia’s culinary landscapes, taking part in one of Bali’s best cooking classes should be high priority. Spice up your sambal skills, learn the tricks to traditional cooking techniques, and nab the best ingredients from the local markets to really nail a Nasi Goreng. Don’t go chasing waterfalls – unless they’re as beautiful as in Bali! 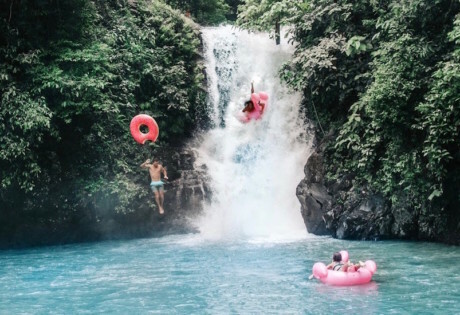 A must for your island hit list is without doubt an adventure to one of Bali’s best waterfalls, some of which you can jump off, swim underneath, or admire from a distance. 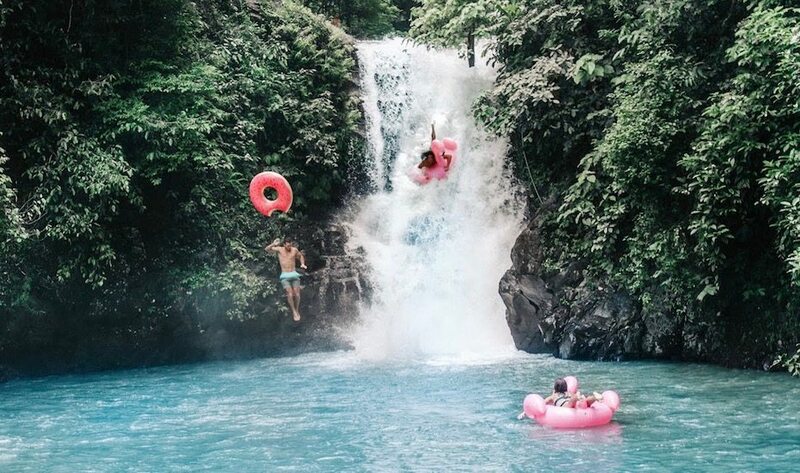 Our fave has to be Aling-Aling Waterfall thanks to its natural slide that has formed over the years – pop on a lifejacket or grab a floatie and slide your way down the smooth rocky edge – weeeee! This ancient tradition is still very much part of the Balinese culture, and definitely worth seeing on any Bali holiday. Head to the Pura Luhur Uluwatu Temple to watch the famous Kecak Dance in an amphitheater (performed by over one hundred men circling a coconut oil lamp) or take a trip to Ubud for the traditional dances at the Ubud Palace, where beautiful Balinese girls in ceremonial attire hypnotically contort their eyes and fingers to tell age-old chronicles. A warung is a type of small, locally-owned restaurant that typically serves traditional Indonesian and Balinese dishes. For just $2 you can feast on a mountain of delicious, authentic grub including nasi goreng, babi guling, beef rendang, tempe manis and so.much.more. Here are 7 of our fave must-try dishes in Bali (and where to find them). Indonesia is made up of over 17,000 islands, home to acres of lush jungle, volcanic peaks, an array of different wildlife, and some of the world’s most biodiverse diving sites. Naturally then, island hopping is a must. 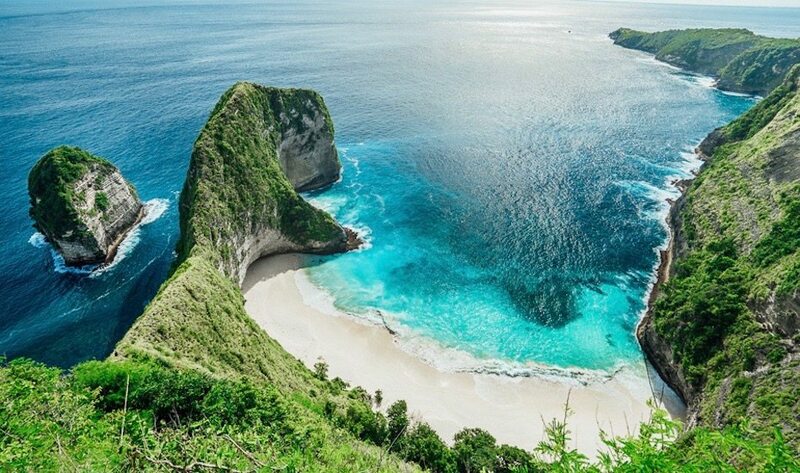 Just a short trip from Bali’s mainland is Nusa Lembongan, Nusa Ceningan, Nusa Penida, and The Gili Islands, as well as mainland Lombok, Sumba, Flores and the southern tip of Java. 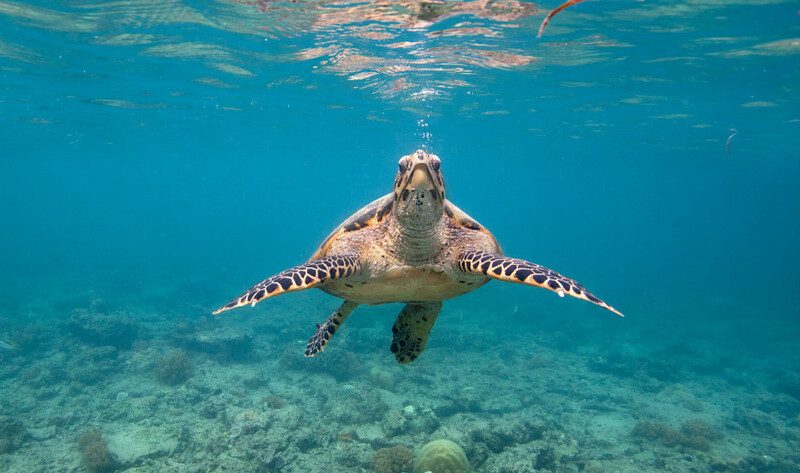 Swim with turtles, laze about on pristine white beaches or surf empty waves – the choice is yours! World-class cuts, boho balayage and blow drys with a Cosmo cocktail – you name it, Bali’s best hair salons have it. And the best bit is, they come at a fraction of the cost compared to back home. So go on, get a fresh do, grab yourself some blonde highlights and finish it with a blissful head massage… You’re worth it! Sorry to go all Eat, Pray, Love on you, but it’s got to be done! For years and years, the ancient ritual of traditional healing has been used to cure all sorts of ailments, using divine energy, herbal medicines and massage to balance the mind and spirit. Don’t knock it ’til you’ve tried it – Bali’s best healers really do work wonders. Get a real taste of Bali’s buzzing neighbourhoods by embarking on gourmet food safari! 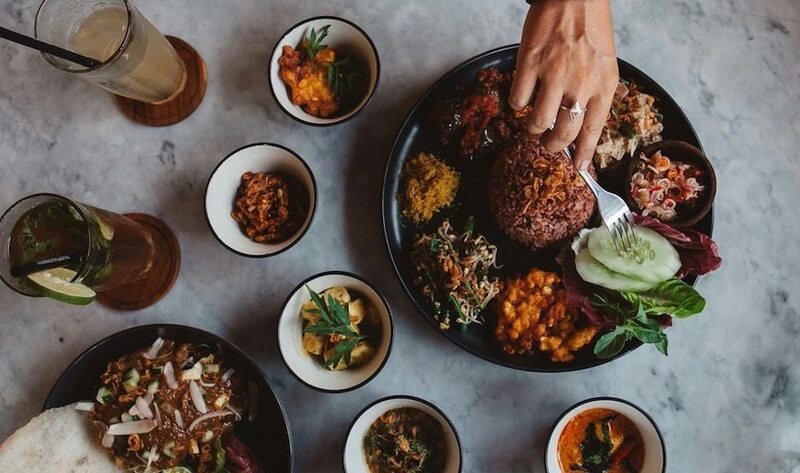 They say that the best way to get to know a place is by trying the local food, so get a real taste of Bali’s most buzzing neighbourhoods by embarking on an epic culinary adventure with Bali Food Safari. 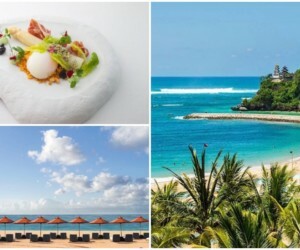 Just as its name suggests, Bali Food Safari takes you on a gourmet tour to a refined selection of restaurants to try their very best dishes (and cocktails!). From Seminyak and Jimbaran to traditional Indonesian street food, eat your way around the island with the experts who know it best! 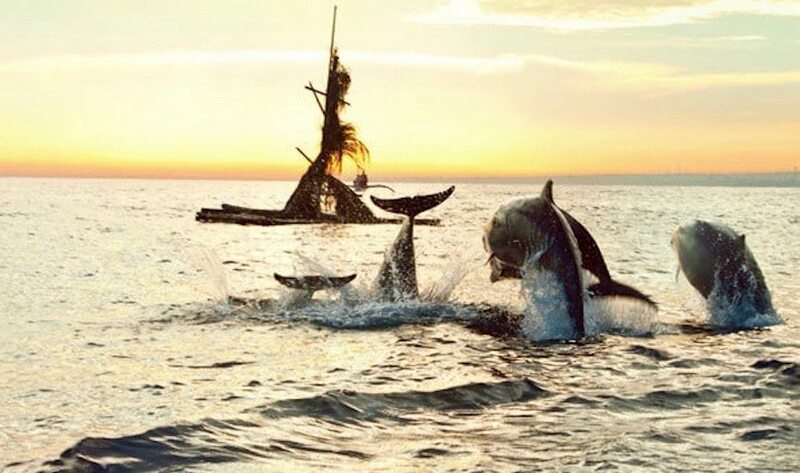 Whatever aquatic adventure you choose, watersports in Bali is a must! With its aquatic playgrounds in every ‘hood, Bali is a mecca for every kind of watersport under the sun (and sea). Got a need for speed? 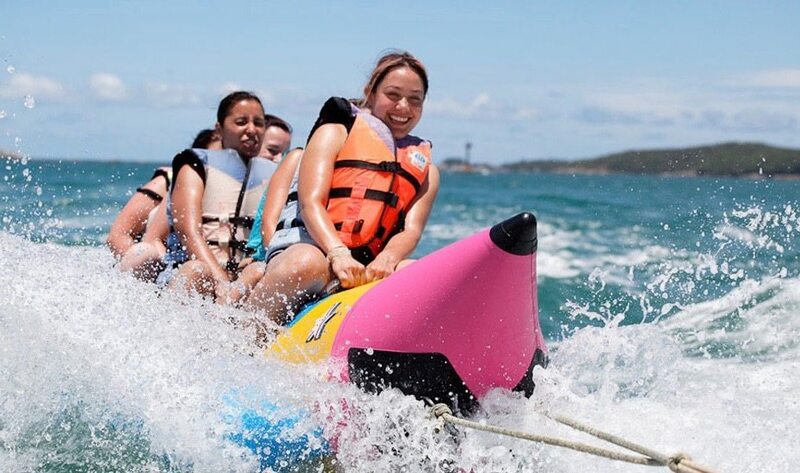 Try jet skiing, banana boating, wake boarding and jet packing. Or take things slow with a stand-up paddle board and search for Nemo with a snorkel. Whatever aquatic path you prefer, watersports in Bali is a must. For Bali’s residents and expats alike, GO-JEK really is LYF. Honestly, we can’t remember how we ever survived before this all-in-one app fell from heaven. So, do yourself a favour and download the app as soon as you arrive – you’ll then have access to cheap transport (like Uber & Grab), home-delivered food from all of your fave Bali restaurants, in-villa massages, on-call cleaners, at-home beauty services, personal shoppers, postal services and even home removal vans – all available at your fingertips! 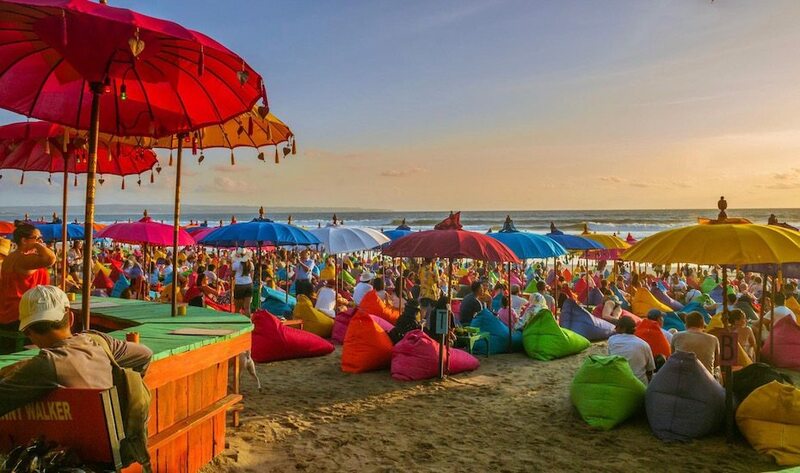 For a golden hour that really glows, settle into one of Bali’s best sunset spots to watch the sky turn to candy. Beach or jungle, if the view fits we say go with it. If you’re not sure where to start, check out our picks of the 30 best sunset bars to ruminate while the sky illuminates. Whether it’s furniture, shoes, homewares, jewellery or clothes, get something unique and made-to-measure when in Bali, exactly how you like it! You’ll spot lots of tailors lining the streets on your Bali adventures, including leather specialists, dressmakers and even artisans of ceramics. There are so many yoga studios in Bali, but our faves on the island are those with a spectacular view – after all, there’s nothing like a lush jungle vista or open expanse overlooking a rice field to really zen out. For these kind of views, direct your stretching to either Canggu or Ubud. 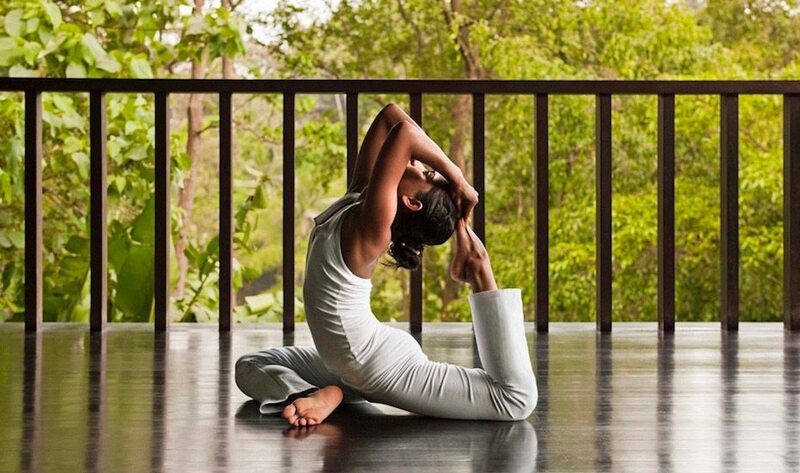 Our fave spots are the Yoga Barn, The Practice and Desa Seni. A cream bath is a traditional Balinese hair treatment used almost daily by Indonesian women (hence their shiny, healthy hair) and works wonders on softening sun-kissed locks. It starts with a head, neck and shoulder massage, followed by a homemade mask that is left on the scalp for 30 minutes under a steamer, followed by even more massaging and conditioning. It’s sheer budget bliss that we highly recommend. Get away from the hustle and bustle of South Bali and head up north to the Bali Barat National Park. Here you’ll be able to take a trip to the nearby Menjangan Island (AKA Deer Island) which has excellent snorkelling, and is home to black monkeys and even gorgeous wild deer. There’s nothing better than cruising through the great open ocean with the salty sea air in your hair and a cold drink in-hand. Well, Bali does it best with a choice of fancy yachts, luxury liveaboards and even local fishing boats like the Black Pearl in Jimbaran that takes you along Bali’s dazzling coastline just in time for sunset. 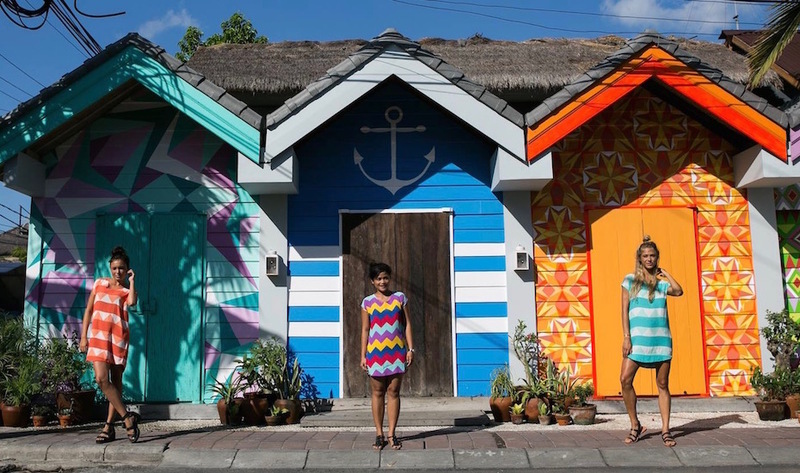 Away from the rice fields and traditional temples of Bali, the hip ‘hood of Seminyak is where it’s at for a bit of glitz and glam. Spend a day here exploring the uber-hip restaurants, the cool Seminyak spas, the hopping beach bars and swanky villas (aka party pads). And if fashion is your thang, you’ll want to shop ’til you drop at Seminyak’s best boutiques. 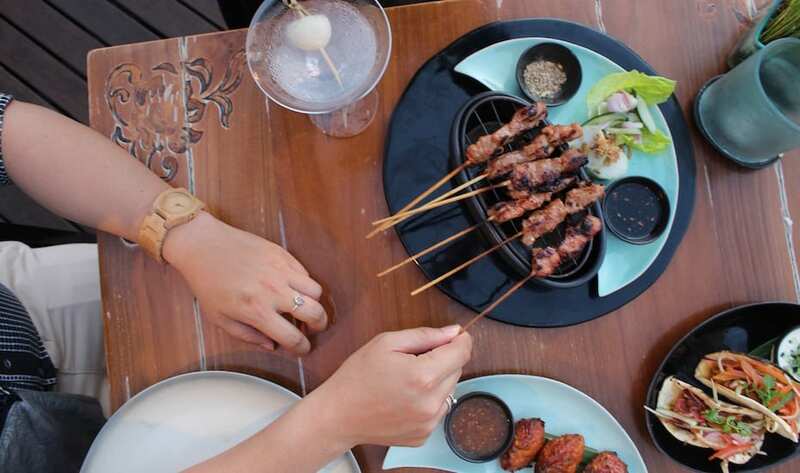 If you time it right, finish the day off with Seminyak’s booziest happy hours. Close to Lovina Beach in North Bali, the sacred ‘Air Panas Banjar’ hot springs are set in the midst of lush jungle and beautifully landscaped tropical gardens. There are three public pools and one private, all with gushing hot water from volcanic origins that pour from the mouths of eight stone-carved dragon heads. Bring your swimsuit and get ready to dive in – it’s picture-perfect and therapeutic too. Mellow white-wash or pumping barrels – take your pick when surfing in Bali! The surf in Bali is world-class, and many pros come to the island just to catch some good waves. There are plenty of different breaks on the island, from gentle white-wash in Kuta that’s perfect for beginners, to pumping barrels in Uluwatu for the experts. Take your pick! No trip to Bali would be complete without a Balinese massage. Why? Because the traditional techniques used by Balinese therapists are the deepest, most ahh-inducing we’ve ever experienced. They use long strokes, firm presses, skilful stretching and the most fragrant essential oils – all for less than $8 for an hour’s bliss. If you don’t want to go local, you can find a Balinese massage at almost all of Bali’s best budget spas. Spend a lazy Sunday grazing on gourmet grub galore! Bali’s brunch scene rivals some of the best in the world, so lazing your weekend away with a Champagne banquet should be high priority. Graze on the island’s best bottomless food spreads, free-flow drinks, ocean views and first-class service – for hours on end. Check out our top picks for brunch in Bali if you’re not sure where to start. Now here’s something you don’t get to do everyday. Head to L’Atelier Parfums et Créations at either AYANA Resort & Spa in Jimbaran or the Ritz-Carlton Nusa Dua, and take part in either a 3-hour or a 90-minute perfume workshop where you’ll get to create your own scent in a 30ml bottle. It makes for a great holiday present for a loved one (or just keep it for yourself!). Watch the sunrise from the top of Mount Batur – you won’t regret it! If you’re looking for things to do in Bali that’ll get your heart pumping, how does climbing to the top of an active volcano sound? Well, the hike up Mount Batur is something we highly recommend (and not just for the banana sandwiches you get at the top!). 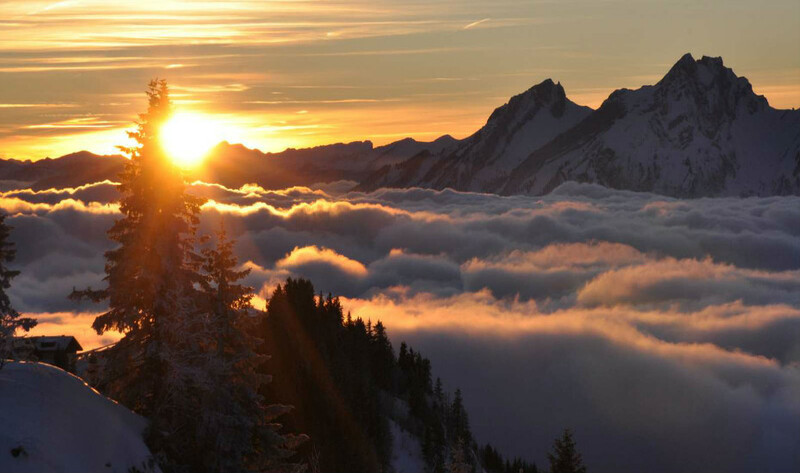 The hike only takes a few hours, and is not too challenging (no proper hiking boots needed) so anyone can do it. It does come with a 3am start though, but that’s all part of the adventure, right?! Fitness in Bali is big, and the island is packed with epic ways to stay fit whist still having fun. ake for instance Ecstatic Dance – an activity with absolutely no rules where you can let go of everything and leave your body to move as it wishes… So go on, shake that bum and have some fun! 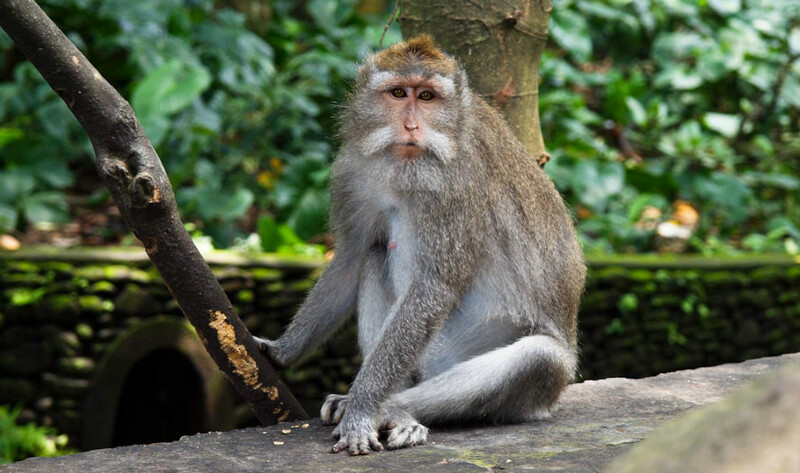 Bali is home to several species of monkey, so it’s not uncommon to come face-to-face with them, especially in Ubud. If you want to get up close and personal with some very cheeky little macaques, visit the Sacred Monkey Forest in Ubud – just hold on to your belongings and be sure to snap a selfie (if you think you’re brave enough!). We’ve said it before and we’ll say it again: Bali’s food scene is right up there with the world’s best. Seriously. 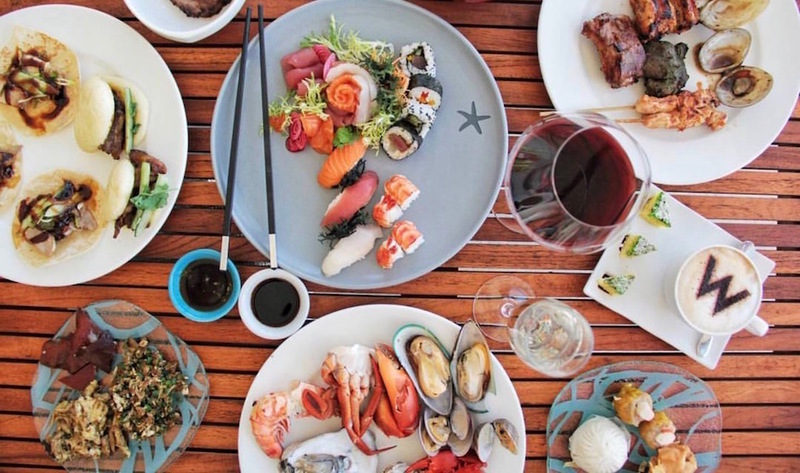 Any itinerary should therefore include plenty of munching opportunities at Bali’s award-winning restos. From Locavore in Ubud to Sarong in Seminyak, work your way through our list of Bali’s best restaurants. Bring an appetite – you’re going to need it. Bali is a predominantly Hindu island adorned with some absolutely stunning temples, so hop on the cultural bandwagon and pay a few a visit. 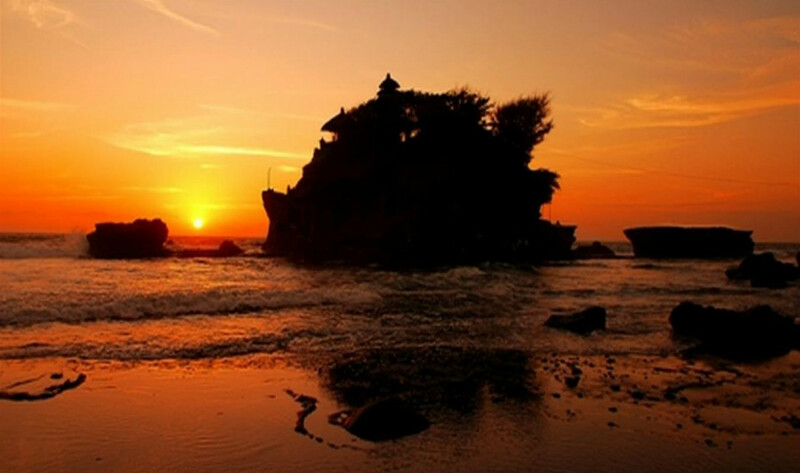 One not to miss is Pura Tanah Lot, a sea temple that perches on the rocks overlooking the ocean – stunning at either sunrise or sunset. Other faves of ours include Ulun Danu Beratan (a floating temple in the middle of a lake) and the Besakih Temple that soars into the sky. Tatts have become more popular over the years, and if you’re in the hipster ‘hood of Canggu, it’s hard to walk down the Batu Bolong strip without seeing a beard and sleeve combo. So if you’re in the market for some new ink, head to Artful Ink in Seminyak or Babayaga in Canggu – tried, tested and approved! If you haven’t sprawled out beside a white sand beach with a designer cocktail in hand and your toes touching a glittering infinity pool – did you even holiday in Bali? Whiling away a sunshiney day (and night) at one of the island’s best beach clubs is high priority on every Bali bucket-list – all you need to do is turn up, tune out and lounge on…. Waterbom has been voted Asia’ best waterpark multiple years running – and we can see why! 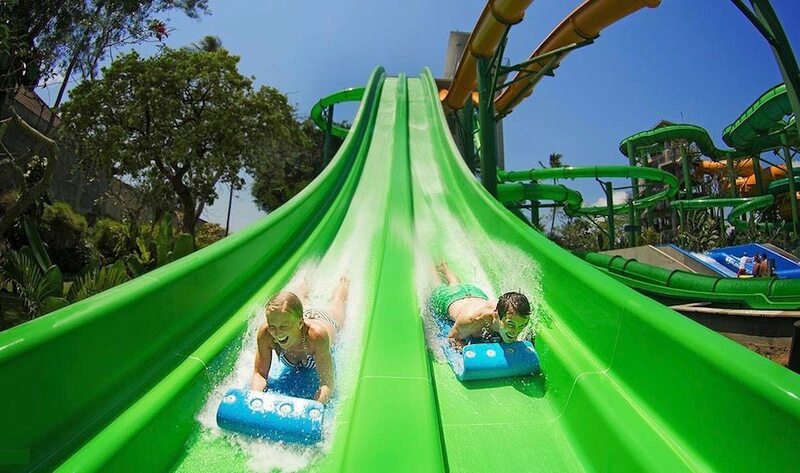 If you want a change of scenery from the beach, head to Waterbom for a day of heart pumping sploshing and splashing! Voted Asia’s best waterpark over and over, a day here is top notch for families, kids, and adults too! It has all sorts of rides, from the Lazy River and the tandem race slides, to the dizzyingly high Climax slide that drops you down through a vertical trap door – not for the faint hearted! Bali has many working rice fields, and the Tegallalang Rice Terraces in Ubud are the most famous on the island thanks to their beautiful valleys of rice paddies that stretch for miles. In every direction it’s a sea of stair-like rice fields, dotted by hard-working farmers tending to their treasured crops. It can get busy here, so if you want to avoid the tourist crowds, head to Jatiluwih instead in the Tabanan Regency. Bali knows how to do good cocktails, and there are some seriously awesome and iconic bars that you simply cannot miss. 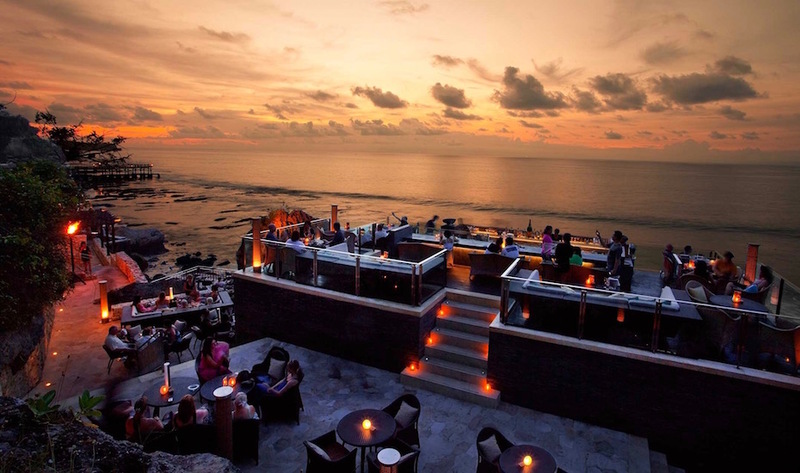 The most famous is probably Rock Bar in Jimbaran (just prepare to queue) so if you want to escape the crowds, try a clifftop spot in Uluwatu instead, or hit the local watering holes in Canggu, Seminyak and even Ubud. Bali’s boho capital is fast-becoming a number one destination on every island itinerary. 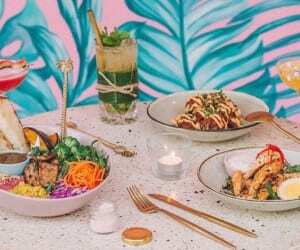 Come here for the spas, rocking bars, and so-hot-right-now boutiques, not to mention the ever-growing collection of Canggu’s best cafes and restaurants that serve everything from raw vegan brunches to date night delicacies. Bali is great for shopping – whether it’s furniture, fashion, homewares, bikinis, shoes, food, or bags – the list goes on! Seminyak’s stores and Canggu’s boho boutiques have the largest collections of western goods, so head here for a day of retail therapy, or get lost in the back streets of Ubud for more traditional pieces and artisanal creations. 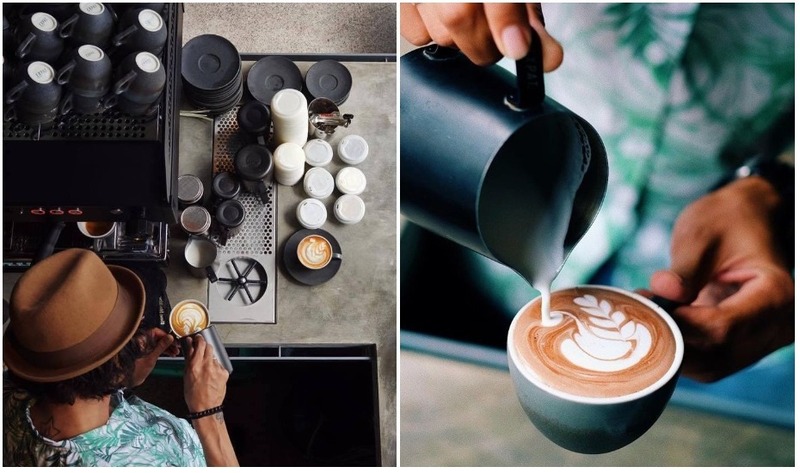 If you don’t have a coffee addiction already, you will by the time you leave Bali. From iced lattes and espressos to cold brews and French presses… Bali has it all. You can check out our fave brews in Bali here, or go straight to the source and see what goes on at a coffee plantation in the quiet and rural hills of Bedugul. 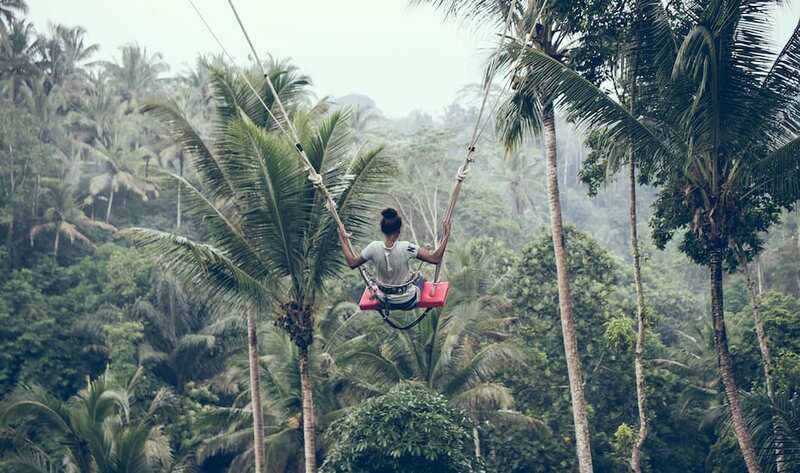 Ubud is mostly known for its food, yoga and relaxation, but there’s actually plenty to do here if you’re a thrill seeker. Jump off waterfalls, quad bike in the jungle, raft down white-water rapids on the Ayung River or downhill mountain bike through the wide open terrains – consider your heart rate lifted! 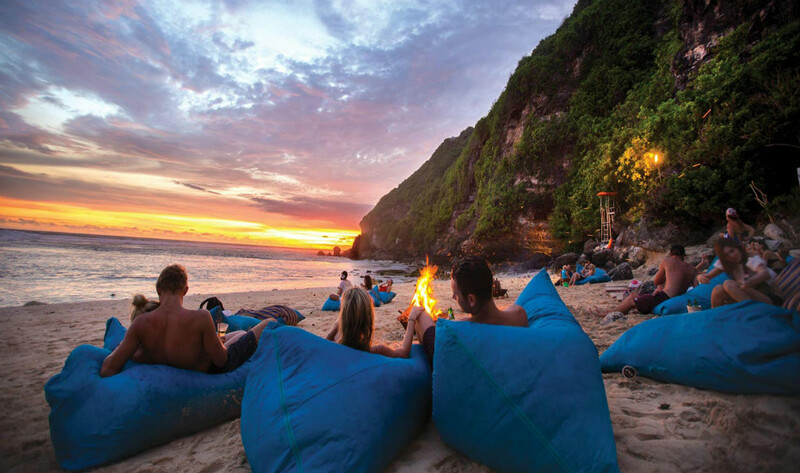 For a magical experience beneath the stars, make your way down the cliff face of Uluwatu to Sundays Beach Club where a nightly bonfire crackles as the sun sets. 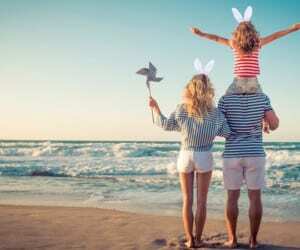 Toast marshmallows on the sand and settle in to the comfy beanbags – and while you’re at it, graze on the gourmet menu from famed Aussie chef James Viles. Bali’s nightlife scene is quite the contrast to the island’s peaceful landscapes and sacred temples, with huge parties at different venues every night of the week. Think Sunday is a day for rest? Think again. 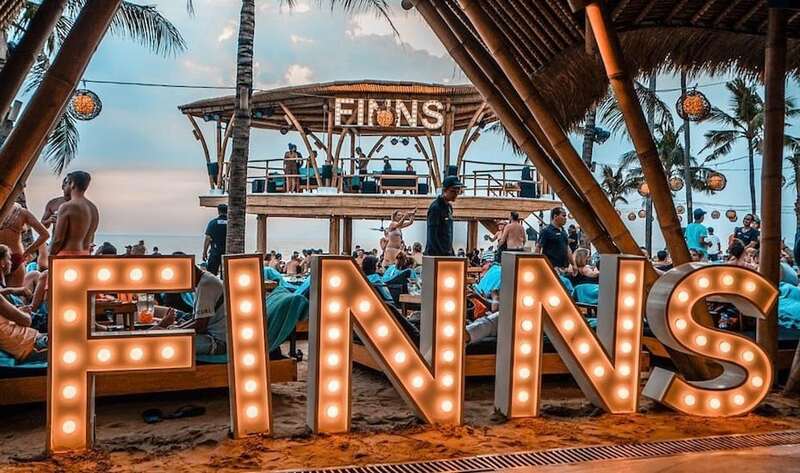 In Bali, Sunday nights are the biggest, with the Phoenix parties at OMNIA Dayclub, wild live bands at Deus in Canggu, and the iconic Single Fin Sundays on the Uluwatu clifftops. Dancing shoes are mandatory. One of Bali’s most colourful horizons can be found within the Marigold fields of Desa Temukus, a remote village in East Bali. 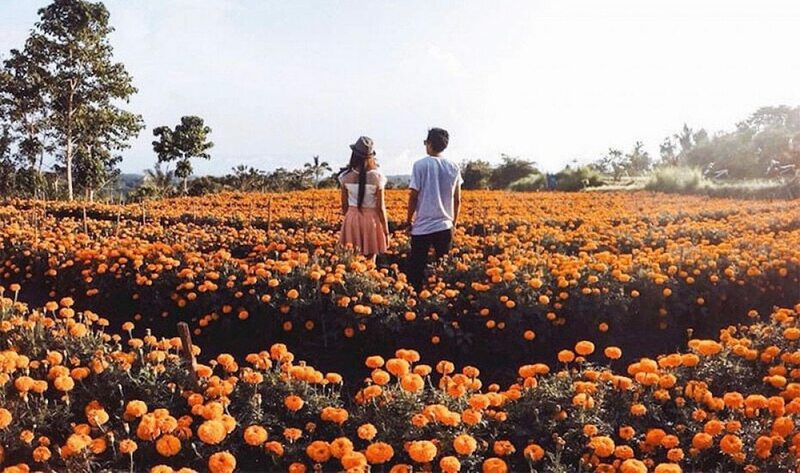 The fields grow Marigolds in abundance to be used in Hindu offerings to the Gods, so the best time to visit it prior to a harvest – a week or so before a big Balinese ceremony. Ask the locals if you’re not sure, as the dates change year-by-year. From wow-worthy villas in Seminyak, to party pads in Canggu and the most incredible castle-like mansions in the midst of the jungle, Bali’s accommodation options are on another level. Beachfront, clifftop or overlooking a rice valley – take your pick because you’ll be amazed at the level of luxury you can get for a lot less money than you’d think. We’ve all seen those mystical pics of the sky-high swing up above the treetops. 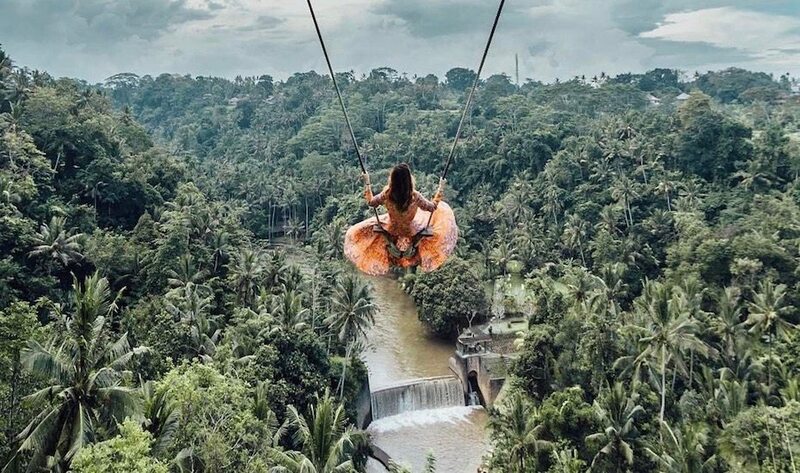 Well, that iconic spot is located at Bali’s Zen Hideaway retreat in the hills of Ubud – but it’s not the only awesome swing on the island. 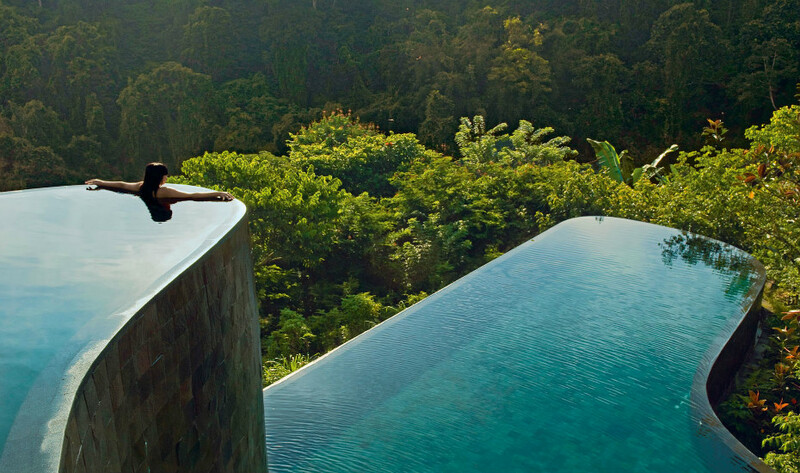 Go to Zen for a jungle vista, or go east to the Bali Chocolate Factory for a sea-view swing. Or, if you want to swing with your toes in the ocean, head to Pandawa Beach or hop over to Gili Trawangan. If a plain-old romantic dinner just isn’t cutting it, make your next date night a wild one at the Mara Lodge’s Tsavo Lion Restaurant. Here, you can get up close with the King of the Jungle as you feast on scrumptious dishes just metres away from the lions, separated only by a glass wall. 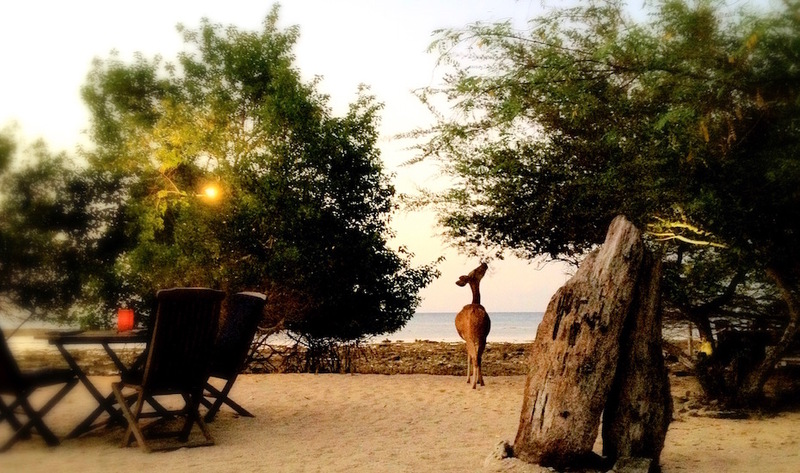 After dinner, retreat to your jungle abode and wake up to roaming zebra out yonder. A trip to Lovina in North Bali is a treat in itself, but add a Dolphin Watching tour onto your itinerary to really make the most of this pristine region. Head out on a traditional outrigger before the sun has risen, and spot the silhouettes of playful dolphins against the luminous sky as dawn begins to break. There’s no better way to start your day. Fresh mountain air, wide open spaces and manicured gardens for as far as the eye can see. The Botanical Gardens in Bedugul really are a sight to be seen, and its bamboo forest is a trail to be trodden. Make a day of it up here and bring a picnic (don’t forget to grab a punnet of fresh strawberries being sold on the roadside) and to up the activity levels, head into the garden’s TreeTop Adventure Park where you can clamber through the trees like Tarzan and Jane. Not only providing a jaw-dropping vista one-thousand steps high, Pura Lempuyang is considered one of the most holy places in Bali. 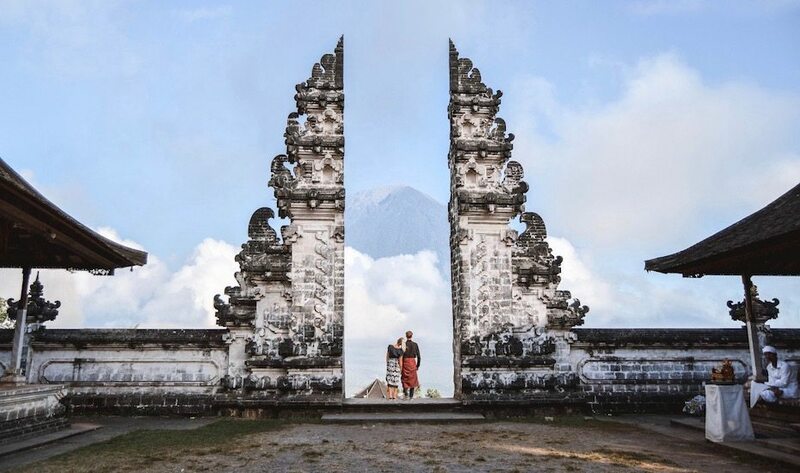 Known as the “Gateway to Heaven”, visit on a clear day and you’ll be able to see Mount Agung’s majestic peak framed perfectly by the temples sides. Make a day of it up here as there are six other temples to explore, plus nearby waterfalls and gorgeous rice terraces. 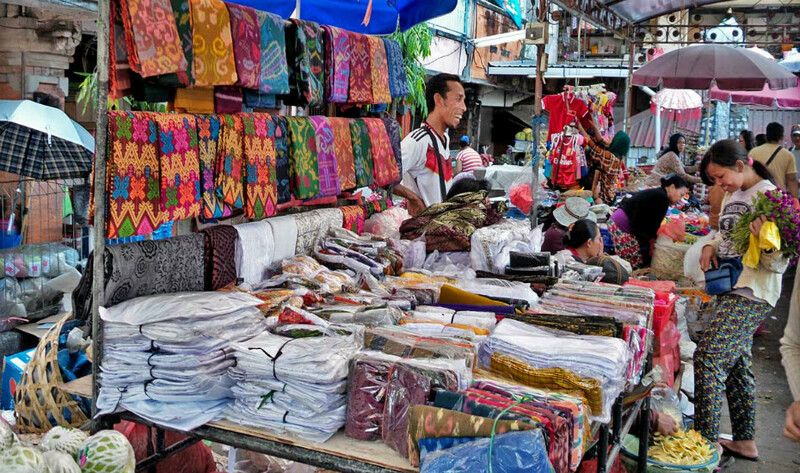 Bali’s traditional markets have everything from fruit and veg to vintage clothes. The early bird gets the worm they say, so get up early and mooch around Bali’s best traditional markets to shop for farm-fresh fruit and veg, hand-made artisanal goods, luxe fabrics and old-school vintage clothes. Or if it’s modern merch you’re after, visit one of the hip tourist markets for all the latest fashion, jewellery and organic produce. Don’t go chasing waterfalls – find them all here! Or sign up for our weekly newsletters for more Bali bucket list ideas! Don't go chasing waterfalls - find them all here!